Monarch Air Group offers a wide variety of private jet charter options to and from Lyon, France. Our clients benefit from top-notch service, unrelenting dedication to safety, wide selection of aircraft, and years of experience in chartering private jets. To obtain a free quote, please use our online quoting tool provided below, or call toll free 1-877-281-3051. Situated in east-central France, Lyon is the third-largest city in the country, after Paris and Marseille. Lyon is famous for its amazing light festival Fête des Lumières, breathtaking historical and architectural landmarks, exquisite cuisine and gastronomy, and is considered a UNESCO World Heritage Site. It is a major center for banking, pharmaceutical, chemical, biotech and software industries. Cathedral of St. John, Chapelle de la Trinité, Saint-Bruno des Chartreux, Opéra Nouvel, Sainte Marie de La Tourette, La Sucrière, Eglise Saint-Nizier are among the most popular tourist attractions in Lyon. 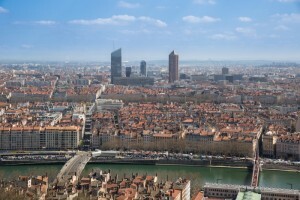 Lyon is served by the Lyon–Saint Exupéry Airport (LYS), which is situated east of Lyon and provides both domestic and international flights, and the Lyon-Bron Airport (LYN), which is dedicated to General Aviation. Our operators are standing by 24/7 to assist you in scheduling your next luxury air charter to Lyon, France. Call us today for a free quote.